Manufacturer & Exporters of ASTM A335 Alloy P9 Seamless Pipe & A213 T9 Welded Tubes, Alloy Steel P9 ERW Pipes, Alloy T9 EFW Tubes Supplier in India. 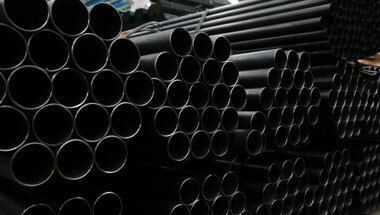 A335 Grade P9 Pipe is a low alloy carbon steel (Cr-Mo) that is self-quench in air, where the welding acquire high hardness and residual stress not recommended to put it directly in services that demand critical conditions. Such situation requires apply Post weld Heat Treatment (PWHT). Also available these ASTM A335 P9 Pipes & ASTM A213 T9 Tubes in different size, grades, thickness & Specification demanded by the clients. These pipes are used in various application industries like petrochemical, engineering, chemical, oil and gas and other industrial etc. We also offer our clients in competitive prices in the market. ASTM A335 P9 High Pressure Pipe & Tube Exporter, Alloy Steel A213 T9 Seamless Tubes Supplier, Alloy P9 Fabricated Pipe, ASME SA335 P9 SAW/LSAW Pipe Manufacturer in India. Democratic Republic of the Congo, London, Nigeria, United States, Canada, Uganda, Sudan, Azerbaijan, Mozambique, Algeria, Egypt, Saudi Arabia, Trinidad and Tobago, Tunisia, Peru, Ghana, UK, Cameroon, Kuwait, Ethiopa, Morocco, Indonesia, Chine, Vietnam, Australia, Africa, Thailand (Bangkok), Malaysia, UAE, Houston, Jordan, Iraq, Italy, Turkey, Sri Lanka, Angola, Russia, Iran, Kazakhstan, Argentina, South Africa, Dubai, Israel, Colombia, Bahrain, Venezuela, Brazil, Germany, Mexico, New Zealand. New York, Kano, Maputo, Tehran, Casablanca, Accra, Dammam, Cairo, Nairobi, Bamako, Mogadishu, Abu Dhabi, Mbuji-Mayi, Soweto, Ouagadougou, Hong Kong, Rabat, Tripoli, Abidjan, Ibadan, Antananarivo, Durban, Zaria, Data from the UN, Khartoum, Harare, Johannesburg, Giza, Yaoundé, Alexandria, Cairo, Conakry, Dakar, Port Elizabeth, Douala, Jerusalem, Doha, Kolwezi, Cape Town, Addis Ababa, Brazzaville, Bulawayo, Lagos, Riyadh, Port Harcourt, Lubumbashi, Colombo, Benin, Subra al-Haymah, Lusaka, Kaduna, Beirut, Singapore, Istanbul, Dubai, Omdurman, Dar es Salaam, Freetown, Pretoria, Jeddah, Fez, Kampala, Sharm el-Sheikh, Muscat, Mecca, Bethlehem, Maiduguri, Kinshasa, Tel Aviv, Byblos, Aqaba, Manama, Luanda, Algiers, Amman.